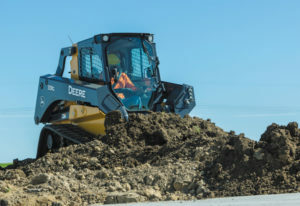 Available as a factory or field kit option, this new feature is ideal for job sites that involve leveling and slope work, according to John Deere. The integrated on-board grade indication option provides operators with an accurate readout of the cross slope and main-fall slope of the machine. The machine’s cross slope and main-fall slope information is displayed in real time through the machine’s main display monitor. The readout can be easily configured to display either percentage or degrees depending on preference. The absolute and relative slope readouts provide enhanced information to the operator for specific applications. The absolute value readout is useful for providing information during general grading applications that do not need a local grade reference, according to the manufacturer. The relative value readout is well suited for operators looking to alter grade relative to an existing or reference grade.